Proxibid Live a Big Hit! 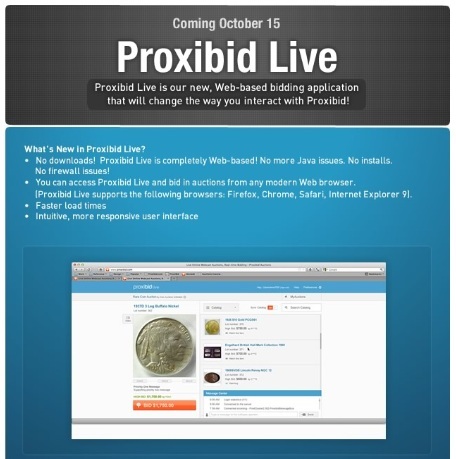 We tried Proxibid Live’s new application window, and it is everything that the company touts … and more. We had asked before for a technical upgrade such as this that works on a common browser like Firefox (which we recommend over other browsers for faster no-security-warning bidding). And the company came through. What we didn’t anticipate is the neatness of the functions and the ability to toggle back and forth between auctions. This will be a boon for bidders who monitor several auctions occurring at the same time, as happened yesterday with Kaufman Auction and Weaver Auction, both of which had choice lots and enthusiastic bidding. You’ll be seeing more bidding wars as buyers compete across the portal for cherry coins. Read more about this exciting enhancement by clicking here. 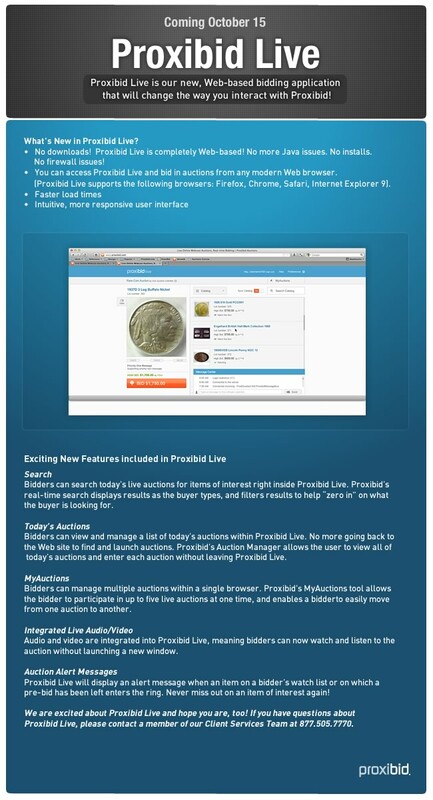 This entry was posted in News and tagged American Numismatic Association, Auctioneers, AuctionZip, Best Practices, Coin Auction, iCollector, Kaufman's Auction, National Auctioneer Association, Proxibid, Proxiblog, Weaver Signature Coin Auction. Bookmark the permalink. ← What’s with DMPL photos on Proxibid?